Fr. Steven Evans has served St. Andrew's since November 2010. 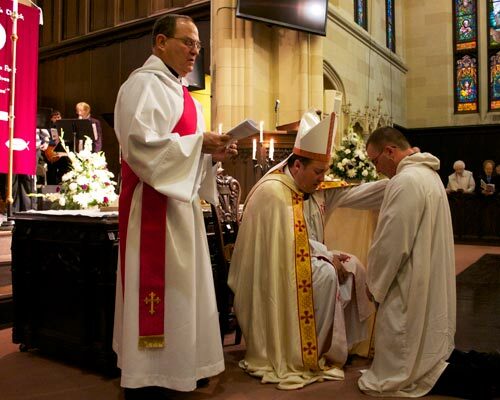 He was ordained by Bishop Doc Loomis as an Anglican Deacon on August 19, 2012 and as a priest on February 23, 2013. He is licensed for ministry by Bishop James Min Dein in the Diocese of Sittwe in the Anglican Province of Myanmar. Fr. Steve values servant leadership, authenticity, love, gratitude and grace. Steven loves serving as an Anglican Priest and especially serving what he affectionately calls, "The world's greatest Anglican Church, St. Andrew's." He is passionate about teaching the Scriptures and spiritual formation for all ages, entrepreneurial ministry, new church development, the Alpha courses, healing prayer, personal discipleship and humble cross-denominational collaboration for the Kingdom of God. Steven was previously ordained in the Evangelical Covenant Church in 1997. He has served churches in Willoughby Hills, OH and Watertown, NY and has worked as a Festival Director for the Steve Wingfield Evangelistic Association. Steven is a graduate of Roberts Wesleyan College (BA), North Park Theological Seminary (M.Div. ), The Arrow Leadership Program and received a certificate in Web Design & Maintenance at OCM BOCES. Steven and his wife, Alyx, have been married since 1991 and have 5 children: Katelyn, Carter, Benjamin, Nicholas and Jacqueline. They home school and live in Liverpool, NY. Steven is an avid biker and can regularly be found in Onondaga Lake Park and on the Erie Canal Towpath. He is also a genealogist and loves baseball. Tim DeGraff was ordained a deacon in November 2015. 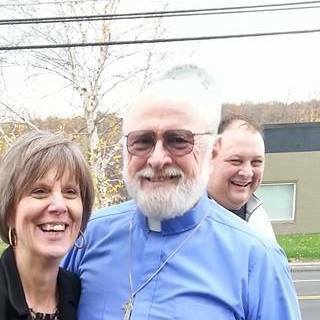 An active believer for 35 years, Tim finally responded to the call of ordained ministry after retiring. He transferred membership from an Assemblies of God Church to St. Andrew’s Anglican Church over seven years ago and began the study of the scripturally grounded Anglican spirituality and traditions. Prompted by the Holy Spirit, encouraged by his wife, Patty and his pastor, Fr. Steven Evans and the members of St. Andrew’s, Tim began a course of study, “Reading for Holy Orders” assigned by the Anglican Mission. Upon completion, Tim was accepted as an “Ordinand for the Sacred Order of Deacons”, a vocational call. His ordination is the result of response to the call. One of Tim’s mentors, Fr. Robert Grant, calls this “A date written in Heaven”. Tim is married to Patty and has three grown children, David, Jim (Julia) and Michelle and two granddaughters, Rose and Tia. He is licensed for ministry by Archbishop Masimango Katanda of the Anglican Province of the Congo. St. Andrew's has had the great privilege of having Fr. 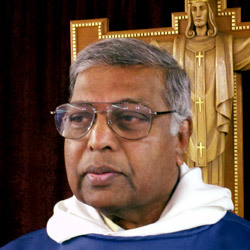 Samuel Coilpillai serve as Assistant Priest. He and his wife, Hepsie, moved to the USA from India in 2005 and returned in 2017. Though he is not currently serving our congregation, we consider he and Hepsie as beloved friends of our church and his work there is an extension of our ministry. Fr. Sam is licensed for ministry by Bishop William Mugenyi in the Diocese of Boga in the Anglican Province of the Congo. Sam started out in the field of banking and finance, working for several large international banks. He studied for the priesthood and was ordained in the Church of North India, a church in the Worldwide Anglican Communion. St. Andrew's is blessed by the leadership of its Vestry members: Rector’s Warden: Holly Delavan, People’s Warden: Paul Norris. Vestry: Marie Whyland, Juleen Iannotta, Katie Polhamus and Vince LaTorre. Treasurer: Joe Rescigno. Financial Secretary: Juleen Iannotta. Clerk of the Vestry: Katie Polhamus. St. Andrew's is a member church of The Anglican Mission Internationals: A Society of Mission and Apostolic Works. The Mission exists to raise, release and support leaders and communities of faith to reach the lost for Jesus Christ across the globe. Rooted in the Celtic missionary tradition and nourished by the three streams of Scripture, the Sacramental Life and the Holy Spirit, The Mission has catalyzed over 200 church plants since its establishment in 2000.